What is the public service? Around 15 per cent of the Australian workforce is employed in public services. Australia’s public services cover the three levels of government: federal or Commonwealth; state and territory; and local government. In addition to people directly employed by governments, people are also employed by statutory bodies, government business enterprises and government-owned companies. Most public servants are employed by state governments. The state government workforce is the largest at around 73 per cent of the total. The public sectors are not a single labour market even though they share many principles, policies and practices. All levels of government are hierarchical and have distinct responsibilities. These responsibilities are divided up between departments or agencies and statutory bodies. The way these responsibilities are divided up is determined by the elected government of the day. These divisions can change. For example, when there’s a change in policy emphasis, a department can change name, take on new functions and drop others. What is the Australian Public Service (APS)? The Australian Public Service refers to staff working in Commonwealth Government departments (also called agencies).These staff are employed under the Public Service Act 1999. Other staff employed by the Commonwealth Government are employed under different Acts of the Commonwealth Parliament. For example, members of the Australian Defence Forces are employed under the Defence Act 1903. Only 33 per cent of Commonwealth bureaucrats work in Canberra. Nearly 38 per cent work in NSW and Victoria with the remainder spread across other states. A shift has occurred away from a lifetime career towards public sector employment as part of a broader career. The median length of service is 8 years. Regulatory work is an important part of the public service. This work covers such areas as aviation safety, customs and quarantine, drug control and industry competition. Most of this work is largely invisible to the public, that is, until something goes wrong. Nearly 60 per cent of APS employees are either directly or indirectly involved in delivery of services to the general public. As at June 2004 the APS workforce numbered 131,522 people. Around 45 per cent of all employees recruited during 2001-02 were working in the private sector prior to entering the APS. A shift to higher classification levels has occurred, resulting in fewer relatively unskilled jobs and fewer opportunities for young people. Most base-level recruitment in the APS is now at the APS 3-4 levels. The profile of the APS, like the wider Australian workforce, is aging, with the median age for all staff being 41 in June 2002. What do public servants do? In broad terms, public servants are responsible for assisting the Government to carry out its functions, which include preparing policy advice to Ministers, implementing policy decisions, drafting legislation and managing contracts to ensure the delivery of government programs. How does an outsider learn about the APS? You’ll find useful web sites in the article 30 government web sites for job applicants. How do you get a job in the APS? a specific, permanent (ongoing) job publicly advertised in a newspaper or website or advertised in the Public Service Gazette (Gazette). a job through an advertised bulk recruitment process. a job through a recruitment firm. a place on an agency temporary register. 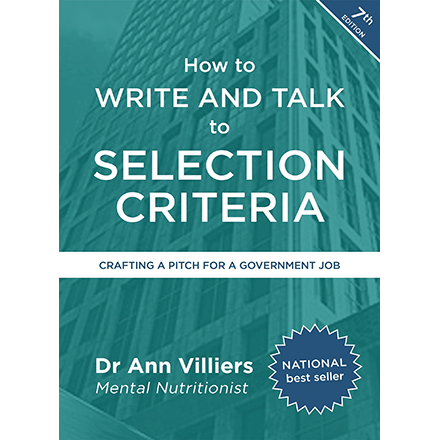 Dr Ann Villiers, career coach, writer and author, is Australia’s only Mental Nutritionist® specialising in mind and language practices that help people build flexible thinking, confident speaking and quality connections with people.